NOW Even Better! We are now offering the Dynapro Commercial Vacuum Blender Model DSP-1050A-B that includes the automatic vacuum pump and clear carafe with improved blending performance. 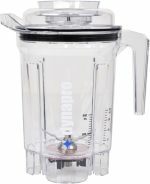 The Dynapro blender is unlike ANY other blender on the market at this time. It is the first commercial blender in the USA to include a vacuum function that will remove excess air inside the carafe before blending. 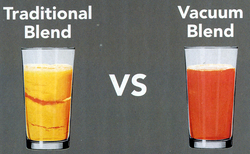 Allow you to benefit from maximum nutrients in your blended creations compared to a traditional blender. Keep the brilliant colors. Traditional blenders mix in the excessive air and cause rapid oxidation of the food which will cause colors to look washed out and lessen nutrition. Create Smoothies with less separation and a smoother taste without excess air mixed in. The Dynapro features a powerful 2.5 HorsePower motor, integrated 4-spoke blending blade, a large 64 oz. container, and a vacuum blend option. The Dynapro Vacuum Lid is designed to work with the included handheld Vacuum Pump, to reduce oxidation by removing air before blending. With less oxidation, you can enjoy more nutrients and enhanced texture and flavors in your smoothies. The Dynapro�s blending container includes a unique thermochromatic ink raw temperature indicator that helps you maintain a raw temperature in your blend. The blue mark changes to white at 118�F and above. Dynapro Commercial High Power Blender is beautifully designed to provide the power and capability you need in a commercial environment or your home. A 64 ounce break-resistant pitcher comes standard with the Dynapro, when used with the vacuum lid and pump, it helps protect your food from the color, flavor and nutrition changes that occur due to oxidation. The Dynapro DSP-1050A has newly upgraded designed 4 point cross stainless steel cutting blade that blend, grind and pulverize ingredients even better than before. The new blade assembly is sure to offer you many years of dependable service. This powerful vacuum helps preserve freshness and nutrients. 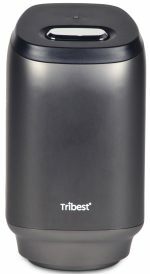 By removing more air, the Tribest Vacuum Pump helps reduce the effects of oxidative damage to your foods. Flavors and texures are also preserved when processed under vacuum. The powerful 2.5 horsepower motor is computer controlled with 3 modes of operation. The easiest are one-touch buttons that will run the blender at various speeds for 30 seconds and stop when its finished. The first blender in the market to have a raw temperature indicator that will change color if the temperature in the carafe exceeds 118 degrees. It is said 118 degrees is the temperature that enzymes can begin to degrade and lessen the nutrition of the food being processed. With this indicator, you can stop the blending process if desired. 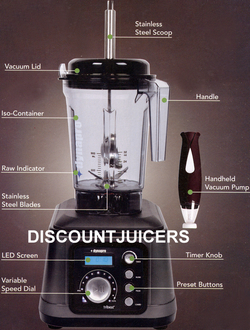 With these benefits not found on any other blender on the market, the Dynapro undeniably stands out above the rest. In a traditional blender without vacuum, you will see a less appetizing color, as well as separation of the food you are blending. This is caused by all the air bubbles that are being blended into the mixture when you blend. In a vacuum blender, the excess air has been removed, so you get a much more vivid color, virtually air bubble-free blend every single time. The result is a more nutritious smoothie that can contain up to 3x more phytonutrients and higher levels of vitamin C. Furthermore, when storing your smoothies after blending, it will also retain more nutrition over time. Make nutritious green smoothies and fruit smoothies to increase your fresh produce consumption. Make delicious salsa, guacamole, sauces and even salad dressings using fresh fruits and nuts. Make nutrient dense raw soups like creamy tomato basil soup, coconut curry soup and more. Grind nuts to make nut butter and emulsify ingredients to make dips and spreads. Make mouth-watering frozen desserts like rasberry frozen sorbet or creamy banana ice cream. Grind seeds into powders to get better nutrient absorption of Omega-3 fatty acid rich seeds like Flax and Chia. Safety Interlock - does not allow the motor to turn on without jar in place.